The Essence of Zen is an expert's guided tour of the ins and outs of the tradition's approach to meditation, enlightenment, and the oneness of all things. To read it is to enter into one of modern Japanese Zen's most subtle and sophisticated minds. 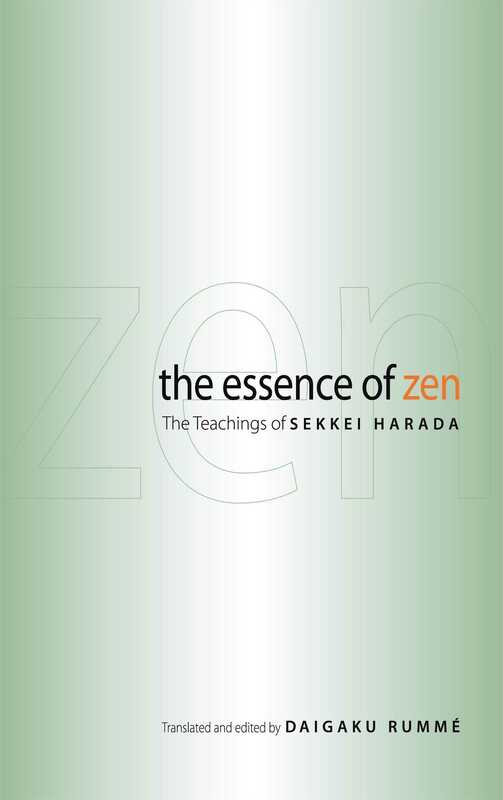 Sekkei Harada skillfully pushes us to drop those parts of ourselves that grasp and make demands regarding our understanding or progress in meditation practice. He enables us to see clearly-and steer clear of-the philosophical stumbling blocks that can make the path precarious. The Essence of Zen represents the most succinct of his teachings, making it of immediate value to anyone with an interest in Zen. The book also contains Harada's explanations of the differences between the tradition's primary schools, making it particularly helpful to newcomers. Sekkei Harada is the abbot of Hosshinji, a Soto Zen training monastery and temple, in Fukui Prefecture, near the coast of central Japan. He was born in 1926 in Okazaki, near Nagoya, and was ordained at Hosshinji in 1951. In 1953, he went to Hamamatsu to practice under Zen Master Gien Inoue, and received inkashomei (certification of realization) in 1957. In 1974, he was installed as resident priest and abbot of Hosshinji and was formally recognized by the Soto Zen sect as a certified Zen master (shike) in 1976. Since 1982, Harada has traveled abroad frequently, teaching in such countries as Germany, France, the United States, and India. He also leads zazen groups within Japan, in Tokyo and Saitama. From 2003-2005, he was Director of the Soto Zen Buddhism Europe Office located in Milan. "The Essence of Zen offers encouragement to the beginner and reminders to the more experienced Zen student. Sekkei Harada reminds us that Zen practice knows no cultural limitations, exhorting us to take practice as expedient means for awakening. He then warns us of the dangers of any goal directed spiritual practice and encourages us to come to realization in our bones, not in our thinking minds. This is a compassionate book from a realized master, a book that deserves to be read and reread." "In this gem of a book, Zen Master Harada Sekkei wields the life-affirming sword of Zen practice. Readers will experience his keen Dharma eye that cuts through even the slightest movement towards self-centeredness and that illuminates the universal law of cause and effect. Harada Roshi's insistence of mutual support among all people serves to inspire readers to affirm a world in which we all awaken together." "Sekkei Harada, one of the most important Japanese Soto Zen masters of this age, goes straightforwardly into the heart of Zen practice." "In this book we meet the big heart of Harada Sekkei Roshi, tireless teacher of the Dharma to many students in America and Europe. He is here, encouraging us with kindness, patience, and clarity. I highly recommend this book." "Harada Roshi goes straight to the heart of the matter with his plain explication of the principles of Zen, exhortation to practice (rather than just think about) Zen, and critique of 'Zen sickness' (the sickness of thinking you're not sick). It's a tough love approach to Buddhism that might be our best protection."